Lessons, camping, trail riding, clinics, but (probably) never shows. We trucked the mustang a couple five hours over to the Cascades for a clinic last weekend. It was his longest trip since he traveled from the Seattle area to Boise for the makeover event where I purchased him in late July of last year. 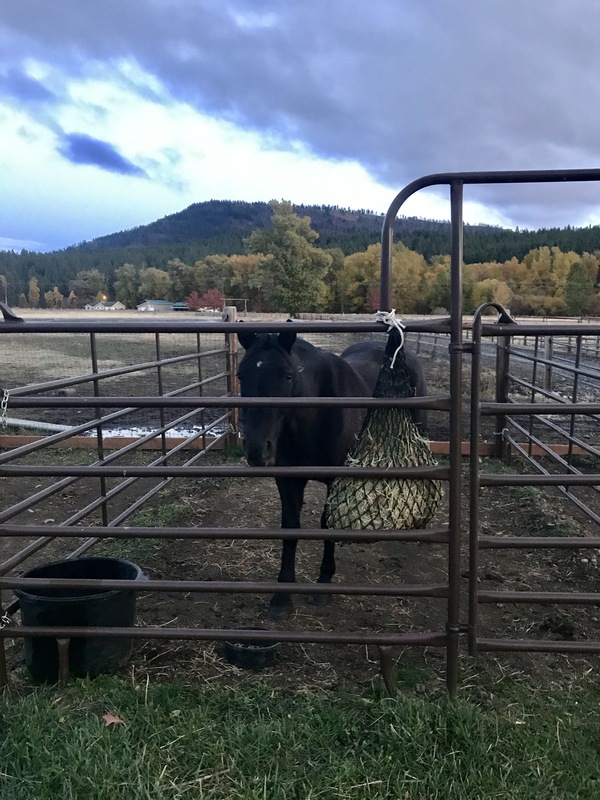 It would also be his first trip to a place with a whole bunch of strange horses since then, coupled with stall confinement (which he doesn’t do here), wet weather, and oh right, the whole clinic and prize ride. I spent much of the days leading up to this weekend alternately shopping for crap I was sure I needed (a blanket for my wild horse, a saddle pad that wasn’t so garishly ugly-colored, a proper cute riding rain jacket for myself, waterless shampoo so I wouldn’t have the dirtiest horse there, etc.) and watching videos online about how not to be an idiot novice horseman. I’m not sure how I did, but I only bought the blanket and that turned out to be a good decision. The drive was uneventful and we arrived with an hour to spare before darkness descended. The mustang did not care about the presence of the other horses; he was much more interested in the fact that he was back in the real Pacific Northwest where they still have ample lush clover and green grass in October. All settled in to his little outdoor stall. This is the driest he’d be all weekend. This clinic and campout was called the Mustang Rendezvous Clinic and Retreat, and I was really looking forward to both meeting other mustang owners and re-connecting with the trainer who gentled my mustang (also the clinician). Sunday there was a “prize ride” which is also known as a “poker ride” (I’m still not sure I understand what that means) to benefit the group Mustang Yearlings and Washington Youth. Let me state for the record right here that everyone involved with this weekend was good people and I’m pretty glad to have met them all. So after settling in on Friday we humans enjoyed a potluck and discussed whether or not to trailer from the adorable host site, Flying Horseshoe Ranch, to the closest nearby barn with an indoor arena for the day Saturday in lieu of conducting the clinic in a roofless outdoor in weather conditions that were predicted as ‘100% rain, all day.’ My initial impression was that these people were a bunch of weenies, what the heck is a little rain? We had after all already trailered across two states to get here and I kind of wanted to stay put. But we would of course amicably go along with the majority, who voted on paying the $10 per person fee to trailer in. Saturday around 5 am the rain started. We were holed up in a summer sleeping cabin with a tin roof and I was already not sleeping due to nerves and because it was about 45 degrees and for some reason my 20 degree down bag was not doing me any favors. We got up and fed in the downpour, then had breakfast and loaded up. At this point I had still not broken out the waterproof turnout that I bought and brought along “just in case” because my horse was a mustang, dammit, and he doesn’t need no stinking blanket. Illustration of said mustang, in fact needing blanket. The indoor was lovely and dry, unlike the rest of the world around us at that time, albeit cold. In fact quite cold. Cold enough that during the groundwork portion the clinician’s mother, a dear lady, came over to me and said, “I think Henry is shivering!” And sure enough, he was, the poor, soaking wet bloke. The blanket was removed from its packaging and my impression of my horse’s survival abilities was forever changed. I guess this is why mustangs come from the desert and there is no Cascades HMA. Wet + cold = bad for just about everybody, wild horses included. On the ground we did a lot of basic work on personal space, ground tying, proper leading and tool use (flags, whips, rope). Much of this was stuff that I’d worked on and understood, but after many months of working by myself (with the help of the internet) I can’t say how good it was to work on it while watching other people and being able to ask questions. We are basically professional ground-tie-ers. 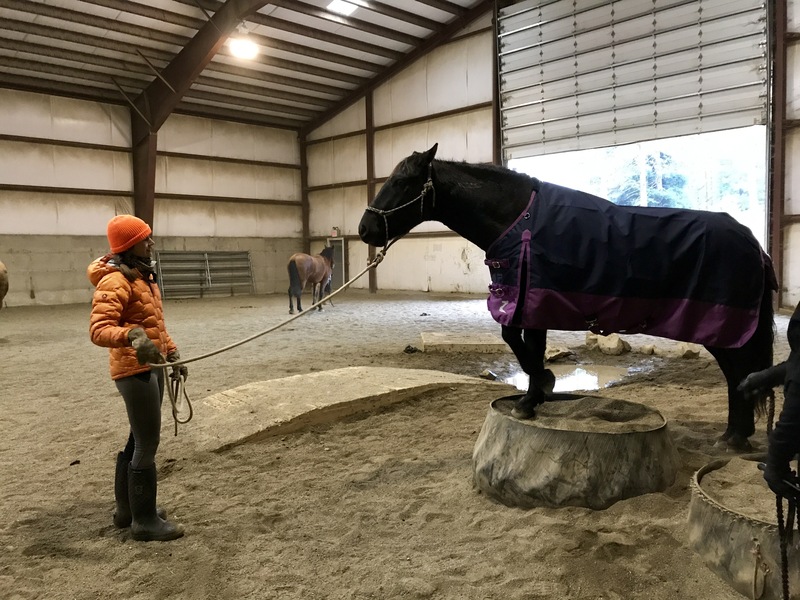 In the ridden session we concentrated on lightness and softness, and I got some special instruction on baby-steps to collection. When I got the mustang I fell in love with the trot his trainer showcased, pretty and engaged, strong and solid. In the year since, under my novice riding, it has turned into a bouncy giraffe impression and I am so ready to reverse that change. 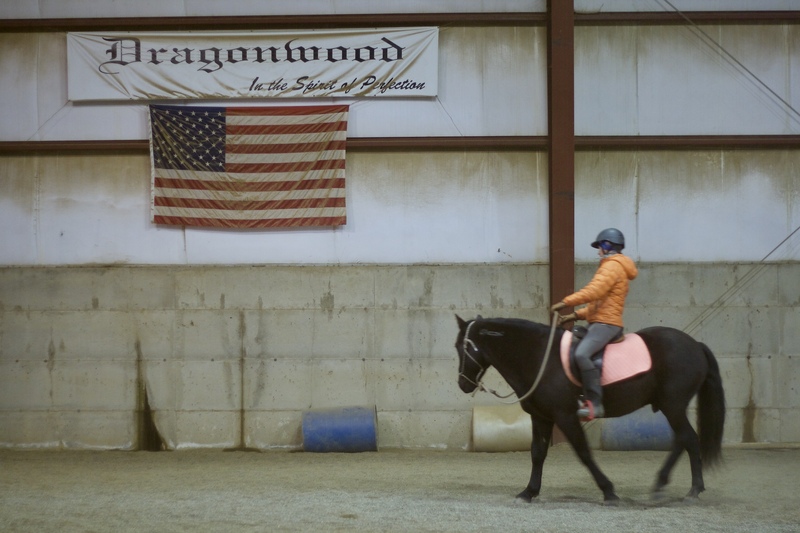 I learned a lot about my riding in that afternoon including that I am both tense AF and leaning all over the poor dude when I’m trying to turn him. Turns out if you put all your weight on his right shoulder while asking him to go right his answer is “no way dude.” Can’t say I blame him. By the end of the session my legs were screaming and I was smiling and I felt like I had a ton of things to work on along with actual ways to work on them. Yay, clinics. 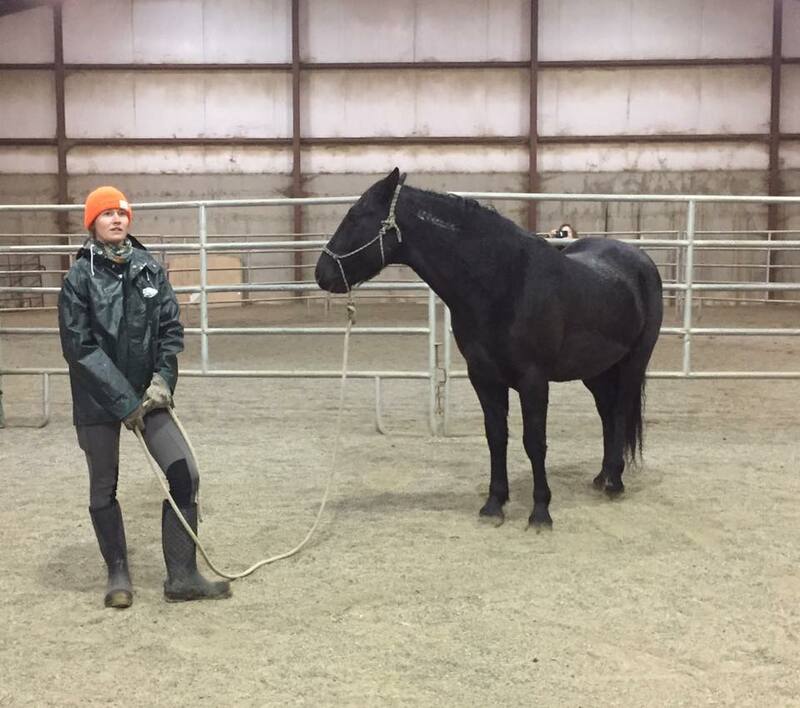 So many things learned, and thanks go to Whitney, mustang trainer, clinician extraordinaire, and overall outstanding human. I wish we lived closer. This post has gotten long, so I’ll wrap up the weekend in another one. To be continued. Categories: Going Places with Horses, Learning Stuff | Permalink.